Today we’re launching a new upgrade to our Visibility Score metric and one other feature that deepens the insights provided by our platform. Though already an amazing metric, the Visibility Score has its quirks: its value changes whenever modifying the keyword list. And that is fine when looking at the chart, as you can easily correlate these changes with the automatic annotations on the graphs. But when looking at the “pill” indicators, the overall trend of the metric includes the keyword list changes and affects its core mission: to clearly show the SEO performance trend. From now on, all the Visibility Score trends shown in red or green will indicate the true SEO performance trend. This comes with a slight change in the Visibility Score explanation as well. We believe that SEO should be as measurable and manageable as any other channel. We can only achieve that by being able to correlate the SEO performance with all the factors that are influencing it. 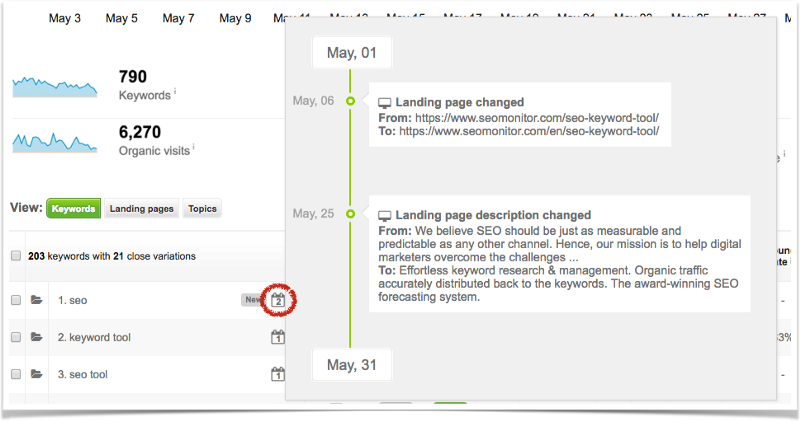 Today we’re taking this further by rolling out a timeline of key changes that might have influenced keyword rankings. Hidden in the above screenshot is another silent update: the tracking of any title and description changes on any landing page triggered by the monitored keywords. This means that not only can you see when changes happen but you can also run A/B tests without configuring anything in our platform. We’ll continue to place new types of annotations on this timeline, to further assist you in correlating the rank fluctuations with internal and external SEO factors. Committed to empowering those who want to move the SEO industry forward.